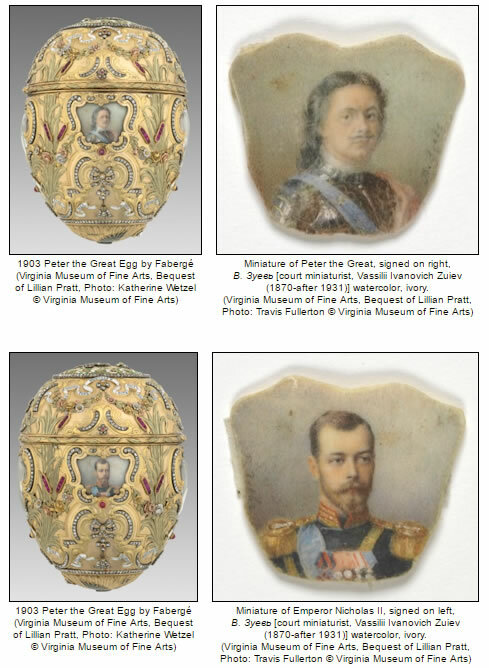 The 1903 Peter the Great Egg is made of red, green, and yellow gold, platinum, rose-cut diamonds, square rubies, translucent yellow and opaque white enamel, rock crystal and watercolor on ivory. Executed in gold in the extravagant rococo style, the curves are set with diamonds and rubies. The dates 1703 and 1903 in rose-cut diamonds appear on either side of the lid. 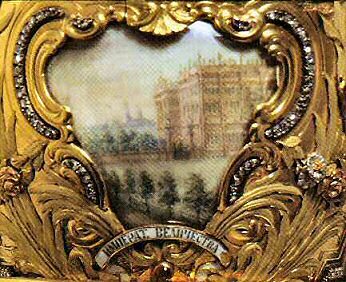 Four miniatures by B. Baal, show Peter the Great, the wooden hut that is traditionally said to have been built by himself, Nicholas II and the 1.000-room Winter Palace as it was in 1903. Each of the miniatures is covered by rock crystal. White enamel ribbons inscribed with historical details encircle the Egg. The inscriptions read, "The Emperor Peter the Great, born in 1672, founded St. Petersburg in 1703" and "The first little house of the Emperor Peter the Great in 1703". The other inscriptions read, "The Emperor Nicholas II, born in 1868, ascended the Throne in 1894" and "The Winter Palace of His Imperial Majesty in 1903". The body of the Egg is covered with a medley of laurel leaves, roses and bulrushes, symbolizing the source of the living waters. To the inhabitants of St. Petersburg, the River Neva was the counterpart of the river Jordan. Every year in the first week of January, the waters of the Neva were blessed. 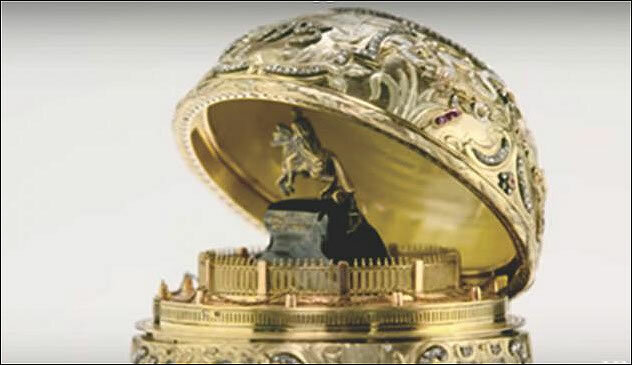 The surprise is that when the Egg is opened, a mechanism within raises into position from the lower half of the shell, a miniature model in gold, made by Gerogii Malychevin, of the famous statue of Peter the Great monument on the Neva, resting on a base of sapphire. The clasp of the Egg is the Romanov Double Eagle. The Imperial Peter the Great Egg, was a commemoration of the 200th Anniversary of the founding of St. Petersburg, the capital of Russia, on which Peter began construction in 1703. This remarkably detailed Egg makes a layered but not subtle statement about political and economic success. Like "before" and "after" photographs, watercolor miniatures occupy opposite sides of Tsarina Alexandra's 1903 Easter gift. Russia 's westernization began with Peter the Great, whose portrait on one side provides a weighty counterpart to that of Tsar Nicholas II on the other. The log cabin on the back commemorates Peter's founding of St. Petersburg in 1703. On the front is a glimpse of the vast neoclassical Winter Palace as it was two hundred years later, during Nicholas's reign. Lift the lid of the Egg and Peter rises on horseback, gesturing imperiously against a sunny dome of yellow enamel, the personification of a royal capital on its 200th birthday. The impressive monument to the founder of St Petersburg, Peter the Great, stands on Senatskaia Ploschad (Square), facing the Neva River and surrounded by the Admiralty, St Isaac's Cathedral and the buildings of the former Senate and Synod, the civil and religious governing bodies of pre-revolutionary Russia. The monument was meant to be a tribute by Catherine the Great to her famous predecessor on the Russian throne. Being a German princess by birth, she wanted to establish a line of continuity with the earlier Russian monarchs. For that reason an inscription on the monument reads in Latin and Russian: Petro Primo Catarina Secunda - To Peter the First from Catherine the Second. The equestrian statue of Peter the Great, created by the famous French sculptor Etienne Maurice Falconet, depicts the most prominent reformer of Russia as a Roman hero. The pedestal is made of a single piece of red granite in a shape of a cliff. From the top of this "cliff" Peter shows the way for Russia, while his horse steps on a snake, which represents the enemies of Peter and his reforms. Ironically, the "evil" snake serves as a third point of support for the statue. 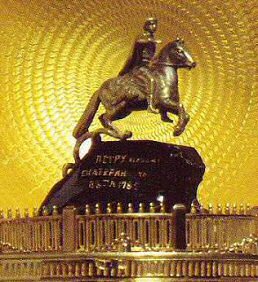 According to a 19th century legend, enemy forces will never take St. Petersburg while the "Bronze horseman" stands in the middle of the city. During the Second World War the statue was not taken down, but was protected with sand bags and a wooden shelter. In that way, the monument survived the 900-day Siege of Leningrad virtually unhurt. Ca 1930 sold by the antikvariat to an unknown American buyer. In the 1930's bought by A la Vieille Russie , New York. Around 1944 bought by Lillian Thomas Pratt. 1947 collection of the late Lillian Thomas Pratt, willed to the Virginia Museum of Fine Arts, Richmond, USA.